We've gotten information that Facebook is secretly lobbying for a dirty bill called “CISA” that would give them impunity for violating their users’ privacy—as long as they hand over user data to the government. Most tech companies are against it for privacy reasons, but apparently Facebook is working behind the scenes to make sure it passes. 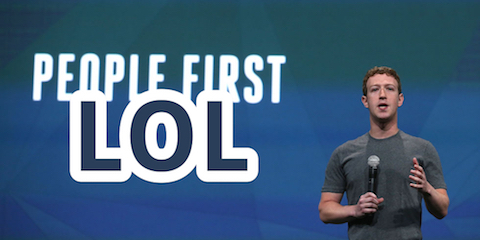 Mark Zuckerberg once called Facebook users “dumb f*cks” for trusting him with their data. Now he’s trying to take advantage of us. If CISA passes, all your photos, posts, relationships, and likes will have a path to government databases. Facebook, are you backstabbing the Internet? Come clean on CISA now. CISA is an assault on privacy and it will actually make cybersecurity worse, not better. If you care about your customers you should make it clear that you oppose CISA and any other attempt to give corporations immunity for negligent security in exchange for handing over user data to the government. We're up against some of the most powerful corporate lobbyists in the country, but that hasn't stopped us before. If a critical mass of citizens speak out against CISA, our voices will be impossible to ignore. We knew Facebook didn’t respect user privacy, but passing a new surveillance law in their name is some next level isht. It didn't make any sense. This bill is toxic. The public hates it and tons of tech companies are against it, but Congress keeps trying to ram it through. Now that we know that Facebook lobbyists are working behind the scenes to get it passed, it makes more sense why Congress keeps coming back to it. Facebook’s chief Senate lobbyist, Myriah Jordan, worked as General Counsel for CISA's sponsor, Senator Richard Burr, right up until taking the job at Facebook. On her lobbying disclosures she lists “cybersecurity” as one of the issues she's been discussing with senators. These “revolving door” connections give companies more power and influence than ordinary people could ever have, and it’s part of the reason why companies like Facebook think they can get whatever they want out of Washington. Several offices on the Hill have heard from Facebook that they support CISA. As much as we wish we could reveal our sources, we agreed not to (selective leaking is part of how the lobbying game works, unfortunately). But this information matches with everything we know about Facebook's love for CISA over the years. They backed the bill loudly before it was unpopular and then stayed silent as other big tech companies came out against it. We've asked them to state their position publicly, but they have said nothing. Facebook has backed this from day one, and now they're the lone tech voice still working to make sure it passes. Facebook wants CISA because they want immunity from privacy lawsuits, but if companies like Apple, Twitter, and Reddit can do the right thing by their users and oppose CISA, Facebook can too. Dial 985-222-CISA to call Congress now. Internet users demand meaningful cybersecurity legislation, not more mass surveillance. Millions have already spoken out, and there's still time to send Congress a clear message. Please call your representatives, and share this page to spread the word!